Hi, everyone. 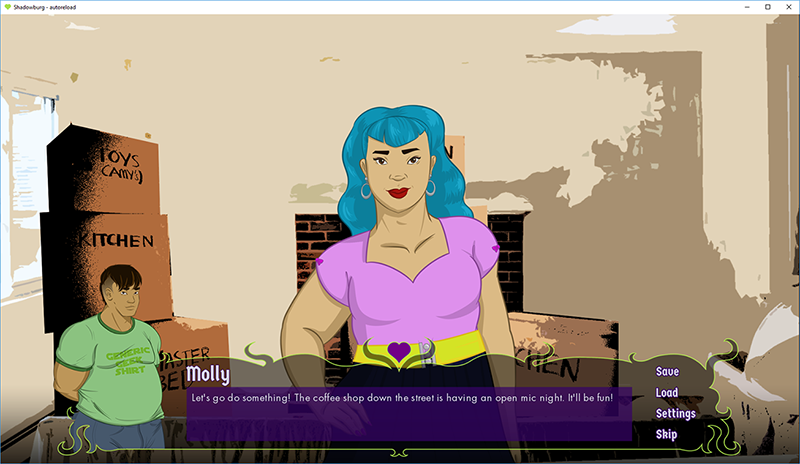 I'm working on my first visual novel, and I'm excited to share some of the progress with you. 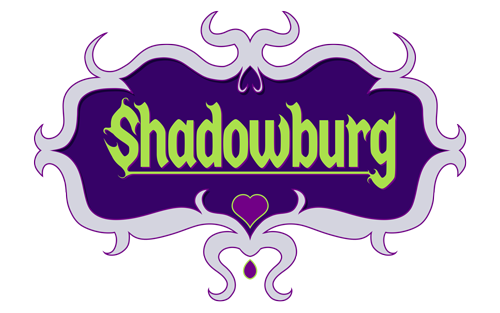 The game is called Shadowburg (as you can see by the logo), and you play Zeb Lee, an artist who has moved to the town of Shadowburg, PA in hopes that a change of scenery will get his creativity going again. Shadowburg seems like the perfect sleepy little town, but Zeb starts to notice that unusual occurences happen on the regular in Shadowburg. He starts to investigate, and along the way, meets two men who, much like Shadowburg, have their own dark secrets. As far as things I would like to know from anyone reading this (hi and thank you btw! ), I guess it'd just be the usual stuff: Does the story sound interesting to you? What do you think of the art? Any advice for a first-time game maker that might not be easily found in the forums? Anything else to share? Last edited by poorlyformed on Thu Mar 29, 2018 9:34 am, edited 4 times in total. I really like that your characters aren't "typical" characters, in terms of variety in body types and appearances. Zeb seems like he'll be interesting to play. Good luck with this! I'm working on my first VN as well (although it's basically just waiting on artists now, because unlike you, I have no drawing ability), and it's been a lot of fun. Don't lose sight of that if/when you get bogged down in one thing or another in the process. I've changed the textbox to show more of Zeb, plus have him there all the time. 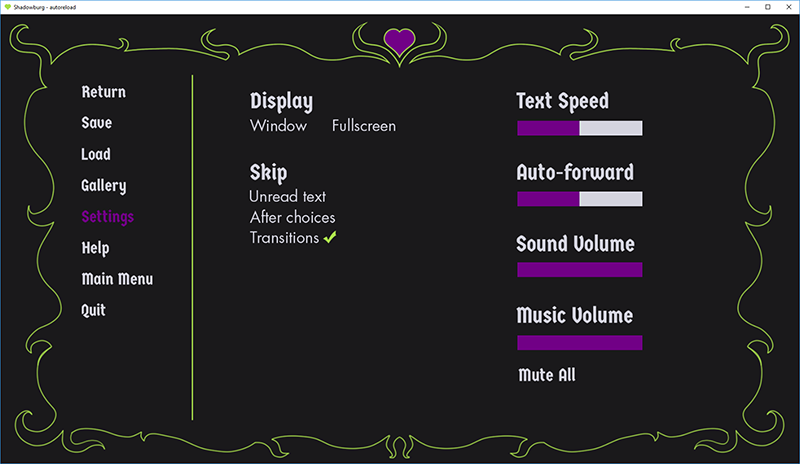 Menus are almost done - just need to finish the save/load and gallery ones. I also figured out LiveComposite yesterday, so I'm pretty excited about that. Main story outline is complete, and will finish the two romance route outlines this weekend. Hopefully. Hey Poorlyformed, congratulations on deciding to make your own VN for the 1st time! You're going to have alot of fun, trust me, it's a very exciting time. I was wondering if we could get more detailed info on the characters (like Zeb, Sean, Niron, Molly)? I wouldn't say you need to go as far as making detailed visual character cards, but I know most ppl on the forums here like that format of having each character showcased. It'll help your audience start to relate to your characters stories/personality and build a "connection". Showing off some side-characters too would be a bonus! Thank you! Parts of it have been frustrating - mostly trying to figure out how to code things - but I'm having fun so far! I do have character bios on my to-do list. I'll try to have them up sometime this week! I like the bigger Zeb portrait, although I kind of find myself wishing it was zoomed in more on his face? At least, that's what I'm used to with character portraits by speech, because the important part to see is the character's expressions, but if he's going to be particularly emotive with his hands or whatever, this seems good too. 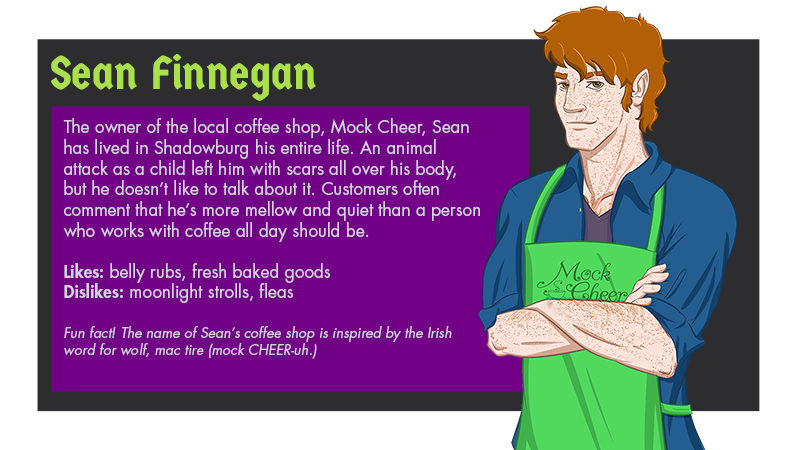 Funny story: When I first discussed the game with my artist and mentioned CGs, he was like "that's a huge undertaking!". Apparently most people think of CGs as video or animation. Yay for VN parlance? Molly is my queen and I would definitely check out her store. This seems like an interseting idea, and I'm curious about what secrets everyone has to hide. They all seem very sweet on the surface, I have absolutely no idea what any of them could be hiding. I agree with bobconway's suggestion to have Zeb's portrait zoomed in more on his face. Fullbody/thigh-up sprites don't tend to work well in a textbox like that; usually you want to have just the face, maybe down to the shoulders. 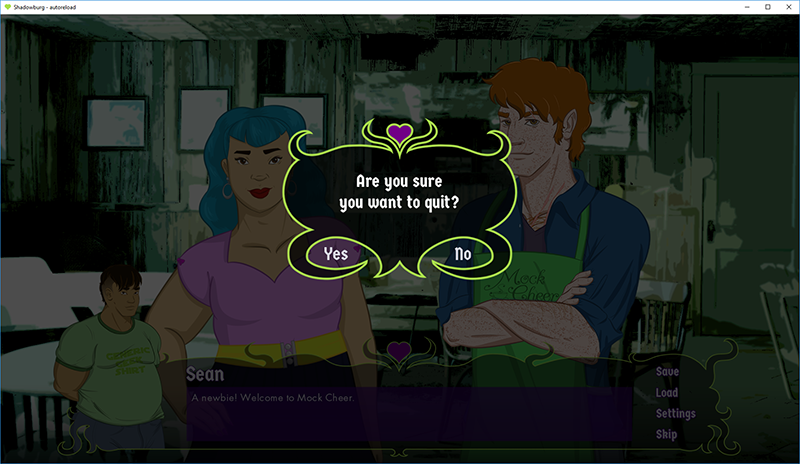 Otherwise, you could just have him onscreen alongside the rest of the sprites, there are plenty of VNs that don't have their MC inside the text box. Like the pitch and the characters. Advice-wise I can only really say; what you think will be hard will be easier than you think, and what you thought would be easy will be the hardest things you do. You will make mistakes, you will have to redo stuff. There's really no advice to give for that, but the experience will be invaluable for future projects. ha! Have already experienced this and am sure will continue to do so. I thought learning Ren'Py would be the most difficult thing, but that was actually fairly easy. The writing is the thing I'm having the most trouble with...speaking of, I should probably get back to it. I am loving your GUI <3 Especially the way you show Zeb in the textbox. This sounds interesting, I'm very curious as to where it'll go! The art fits the style of the GUI, and gives me an image of a campy, fun, scary time, like scooby doo xD We'll see how the vibe of the writing takes it though! 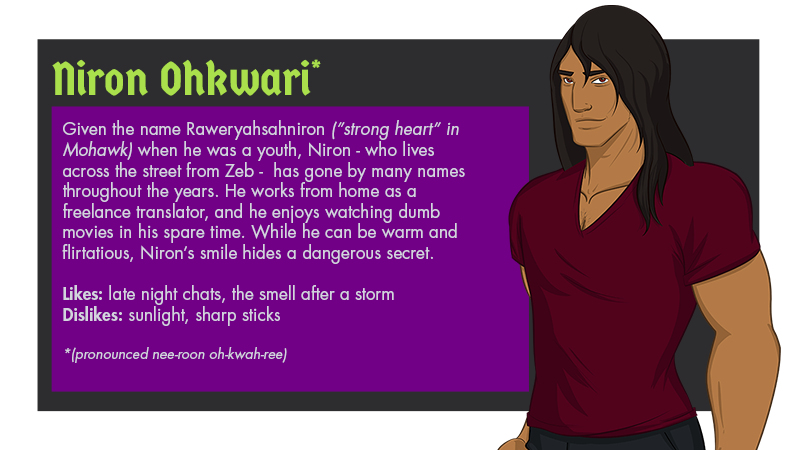 I love Niron's design (but I'm a sucker for guys with long hair) and Zeb's shirt-- fantastic. I also really like Zeb's haircut. As for advice... programming wise I'd say be careful of where you're using calls and where you're using jumps, forgetting to return from a call can be a major headache later! Other than that I can't think of anything that couldn't be found on the forums! I'll keep an eye on this. Good luck getting it together! Apart from the little error when the game couldn't find the save or load screens, and the "return" at the end of the demo sent me back to the last option choice instead of sending me to the main menu, everything went right. I like a lot the atmosphere in the story: as minyan says, it feels a bit like a Scooby Doo story, and I'm thrilled at the perspective of more strange sounds and happenings in the town! The characters, so far, are nice, and definitely they make you want to know more about them. So, patience with coding and keep giving it your best! ugggh, I thought I fixed the Return thing. and I don't understand what's going on with the Save/Load screens. They were fine just last week. SIGH. but thank you for the comments! I need to do some hammering on this. eta: okay, I seem to have fixed it, and by 'fixed' I mean pasted the code from another copy of my screens file because I still don't know what happened. The only thing I can think of is that I must've hit a key when my cursor was in the wrong place. DOUBLE SIGH.